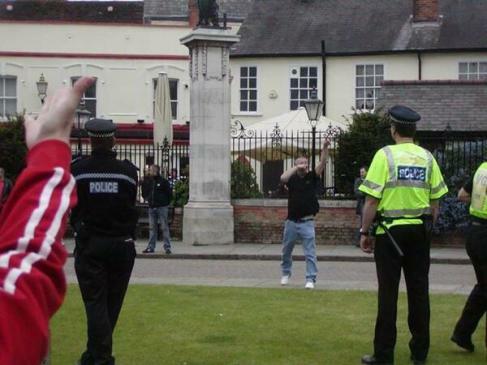 A man seen by hundreds of people doing a Nazi salute during a three-hour stand-off at Colchester war memorial has been jailed for two months. Kevin Reed attended an English Defence League demonstration at the Cowdray Crescent memorial on June 1, when about 60 members were met by anti-fascist demonstrators. The protestors were opposed to the group’s plans to lay a wreath to mark the death of soldier Drummer Lee Rigby, who was killed in Woolwich three weeks ago. Unemployed Reed responded to anti-EDL chants, using the offensive salute and racist language outside the Castle pub. Reed, 50, of California Close, Colchester, admitted two counts of breaching an antisocial behaviour order when he appeared at Chelmsford Magistrates’ Court on Saturday. He was sentenced to two months in prison for each breach, to run consecutively. As part of his order, which runs until November next year, Reed is banned from using threatening, insulting or abusive words or behaviour towards any person or persons not of the same household as himself, be drunk in a public place, or interfere with property not belonging to him. He is also banned from all pubs and clubs in Colchester town centre. Mark Dunbar, EDL regional organiser, has already moved to distance the group from supporters using Nazi salutes, saying anyone at an EDL meeting using the salute would be asked to leave. This entry was posted in English Defence League, Far right racists, UK by Bob Pitt. Bookmark the permalink.